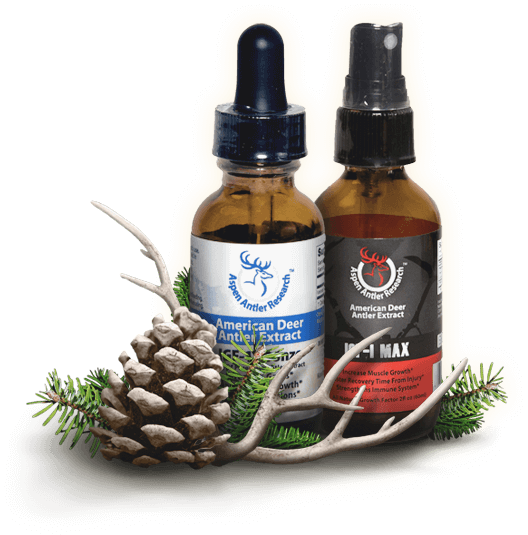 Aspen Antler Extract is the most concentrated form of Velvet Antler Extract available! Made from deer antler velvet grown on farms in the United States, and manufactured using a proprietary process, our products are unique in concentration and dosages available. Including athlete and clinical dosing levels unavailable elsewhere. Our products provide a natural source of IGF-1! At 43X concentration our formulas are 5 times stronger! Sourced & Manufactured in The U.S.A.
Join our mailing list for product updates, promotional deals and the inside scoop anout Aspen Antler Research at Herbal Nutrition! Email Address * * Your email address will be kept confidential and never shared. Velvet antler has been used for over two thousand years in ancient Eastern medicine and is only second to ginseng in importance for the mainstay of Traditional Chinese Medicine. It is considered one of the world's oldest raw super foods because of its nutritional density and lack of caloric impact. Velvet antler has uses ranging from safe anti-aging solutions to enhancing the performance of many elite athletes. Thousands of papers have been published on the composition and biochemical effects of velvet antler and its constituents. This research has consistently revealed a host of health benefits to enhance immune and neurological health as well as metabolic efficiency. Velvet antler provides a more extensive collection of nutritional components than any other single source used to provide raw materials for dietary supplements. The biochemical matrix found in the live, growing velvet antler contains a complete range of beneficial growth factors, saturated fatty acid molecules, phospholipids, minerals, glycosaminoglycans, extracellular matrix components and the complete array of amino acids. Antlers are the only mammalian appendages capable of continuous regeneration. Antlers grow at an amount of one inch or more per day, representing the fastest rate of organ growth in the animal kingdom. They can reach over six feet in diameter and weigh several hundred pounds. Antlers transform each year from cartilage to a state of calcification before naturally falling off and regenerating. During the cartilaginous state antlers are harvested and procured into an extract. The antlers in this state are nutrient rich in IGF-1, growth factors and other protein based structures. The negative side effects that can be attributed to IGF-1 isolates and HGH are directly related to sources that come solely from the synthetic versions of the compound that are developed in laboratories. There is tremendous amount of focus in the training of athletes today to get bigger, stronger and faster by any and all means possible. Unfortunately, this often involves the use of synthetic anabolic agents that have devastating long-term ramifications on the human body. Human growth hormone injections, steroids land other harmful agents have destructive effects on muscle tissues, the endocrine system, exocrine system and even DNA. Works Just FineSo long as your goals are within reason (and not based on comic book fantasies), you'll get something out of this. Five StarsGreat product. It works real well when you follow the directions. I will buy this product again. Five StarsLet me start by saying that I began my relationship with your company by ordering 3-bottles of your IGF-1 Extreme. Great ProductGreat product, already feeling the difference after a week of use. Five StarsHerbal Nutrition was prompt, safe & secure. I immediately began using the product and I have been utilizing daily for an amazing work outs. I will buy again from Herbal Nutrition. Great Price. Incredible Pump & Strength GainsI've been taking deer antler velvet for about 3 weeks now and I am still on my first bottle. My strength gains were noticeable after the first week and are incredible and my pump feels amazing. My muscles look fuller than ever as well. Its definitely a supplement to use as a steroid substitute considering how great the effects are. Stuff Is GreatStuff is GREAT!! The folks down there who sell it are also very great to deal with, and it gives me much needed energy to complete workouts and finish my Men's League Hockey games strong!! Unbelievable ResultsAbsolutely love the palladium extract - seeing unbelievable results - I had a cut the other day on my hand and within five days it's nearly untraceable! Normally a cut like this would take a week and a half or two to heal. I feel sharper and more alert - definitely noticing that I have more energy. Sleeping better. Better digestion. More energy. Dramatic fat loss in two months - it's amazing and I've been cutting up to be leaner without question. I also have found that my recovery after workouts is incredible - no soreness! I think it did or I feel like it does workPlacebo or not, I train with the same guys and can out ride them in leg stamina.